MASsoft Professional is the proprietary control software for Hiden Analytical mass spectrometers. It is a multilevel software system that can facilitate complex data manipulation, with application-specific packages available for quantitative gas analysis. New MASsoft Professional features have been launched to enhance the capabilities of this expansive software package. These include automatic spectral analysis and 3D data plotting, which offer unique benefits for measuring evolved gas species, gas analysis, and performing residual gas analysis (RGA). This blog post will explore the new features of MASsoft Professional in greater detail, offering insights into the performance of automated spectral analysis and deconvolution for gas analysis. 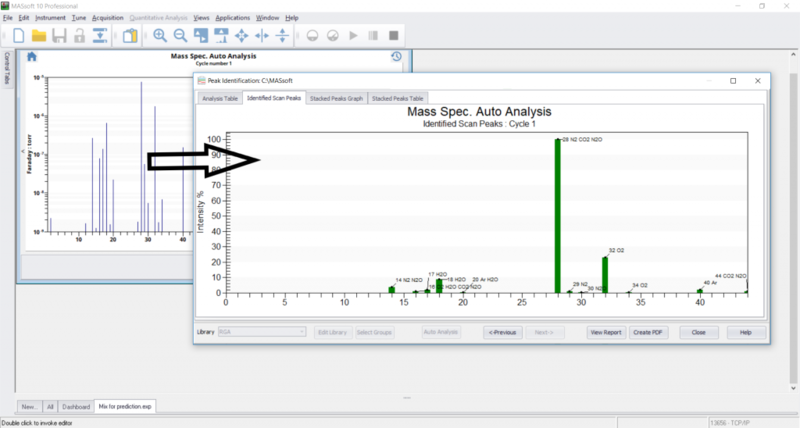 MASsoft Professional enables analysts to retain tight control of both the simplest and most complex mass spectrometer parameters. It is equipped for pre-setting modes of operation and experiment templates, enabling rapid start-up and simple operation with quick-start tabs and a user configurable single key start function. Peak identification is colour-coded to accelerate gas identification against matching species in the software library, with an alert system advising analysts when there is no match for recorded peaks in the spectrum. This warning will advise users to extend the applicable library groups for the application. MASsoft Professional also enables users to edit parameter controls for thresholds of peak inclusion. Pre-set the number of matched peaks, ignore peaks below a specific threshold, scale peak intensity. These tools enable algorithmically-based evaluations of recorded spectra to automatically identify gas species, calculate composition, and estimate their relative concentration. The software achieves this via rapid spectral simulation and subtraction. This provides differential spectra to compare recorded data with a predicted RGA spectrum. Each of these new features is underpinned by MASsoft Professional’s new 3D view, which offers three-dimensional data plotting for viewing mass versus electron intensity. This supports method development in complicated gas analysis studies by offering insights into the appearance potentials of species scanned in multivariable analysis. Hiden Analytical is the UK’s leading supplier of mass spectrometers for RGA and quantitative gas analysis. We supply an extensive range of tools and accessories to facilitate high throughput analysis of evolved and residual gas species at extremely low levels of concentration in vacuum, ultra-high vacuum, and other processing environments. If you would like more information about our MASsoft Professional software for gas analysis studies, please do not hesitate to contact us directly.